Who doesn’t love a good WINTER SALE, especially when you’re on the look out for new warm clothes and trends that highlight what’s in vogue in the new season from the fabric to cuts and embroideries at unbelievable discounts? Ideas by Gul Ahmed is offering a fabulous winter sale with amazing discounts upto 70% off both online and in stores on all their collections; Lawn, Cambric, Black and White and Premium collection. What was exciting to see is that the sale is not just on women’s wear, which includes unstiched and pret, there is something for men too, moreover, the sale also includes pieces like bedding for your home too. And as we rummaged through the variety of options, we decided to pick our top 3 favourite pieces from the women’s cambric collection and show you what could potentially be yours! This pretty, young and fresh pink and sky blue 3 piece suit is a perfect day wear, probably at a lunch that you’re invited to. We couldn’t help but pick another 3 piece suit in in beige and browns with accents of magenta and pink, and also because it is a steal with 30% off. The combination of black and white check design with shades of mint green and a black trouser is the perfect winter vibe. The design is simple yet classic . The same suit is also available in another colour and the mint green is replaced with shades of brown. 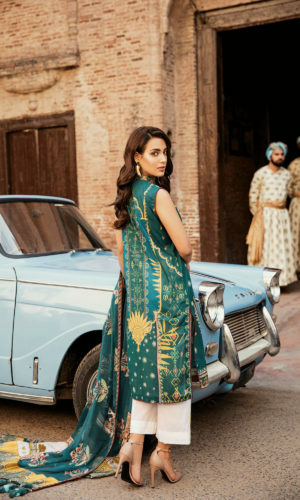 A 2-piece outfit that comes with a printed shirt and trouser, can be paired with a solid coloured dupatta and or an over coat if that’s your style. The print is simple and can be styled right with minimal accessories too. We loved this 3-piece outfit too because we loved the subtle shade of tea pink. Assembled with a printed dupatta and shirt, the trouser is plain, and this is another outfit that you can wear to college or just in time if you’re stepping out. This week in celeb fashion!